We have been making these fun rainbow cups since my sister got married more than a decade ago. Her husband’s family used to make them and they are just so darling that we adopted the tradition. They are really easy to make but they do take quite a bit of set up time, so it is best to make them when you are going to be home all day. Dissolve your first box of Jello in 1 cup of boiling water. Separate the Jello in half, into two bowls. Add two tablespoons of cold water to one and then put separate the bowl of Jello that you added the water to, into individual cups. Place the cups flat in the fridge and allow to set for 30 minutes. Make sure the cups are as flat as possible when you put it in the fridge so your layers don’t end up crooked. After 20 minutes, add 1/3 of a cup of sour cream to the other bowl of Jello that has been sitting on your counter. Mix until well combined. I use a whisk to get it really well mixed. After the 30 minutes have passed and the Jello in the fridge has set up, pull the cups of Jello out and pour the bowl of Jello with the sour cream in it over top the set Jello. Place back in the fridge for 30 minutes. Repeat until you have all 12 layers. I think it works best to start backwards with the rainbow, doing the darkest colors first. Serve with a chocolate coin and some whipped cream! This is pretty darn simple to make and packs a lot of WOW factor! Yes, please I'll take one. OKay maybe two 🙂 I love the colors in those! SUPER cute and super yummy! Ooh id love to try this. Looks like something anyone would love! So awesome! 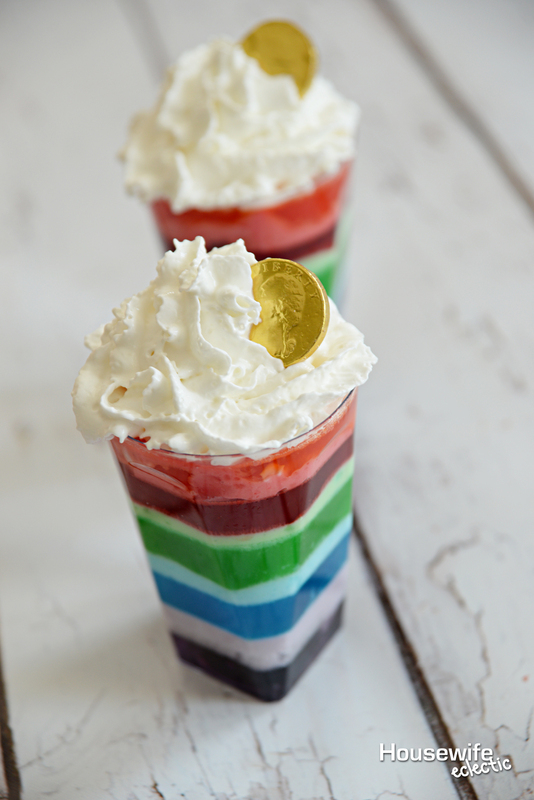 My kids were just asking me to make a rainbow something for St. Patty's Day. This will be perfect! Almost too pretty to eat! These would not only be great for St Patrick's day, but for a kid's rainbow party as well. I'm all for jello treats,but I've never had sour cream with Jello. That's interesting. Those look really good! I would love to try these jello treats. I love family traditions and all the fun stories of how they came to be. These look so fun! these are so creative & what a great treat to have for st. patty's day or perhaps at a rainbow party! The kids would love them. You're right about the WOW factor. What a fun idea and the colors would be so pretty on a table. The colours are so adorable, and the recipe is sound yummy. I think it will be a hit for children party, but also perfect for summmer barbeque dessert. I admire people who are so innovative and creative in the kitchen. Do you post on different food blogs too? And Pinterest these? They look so crafty! Oh my gosh, these are so cute. I love all the colors and the gold coin finish. 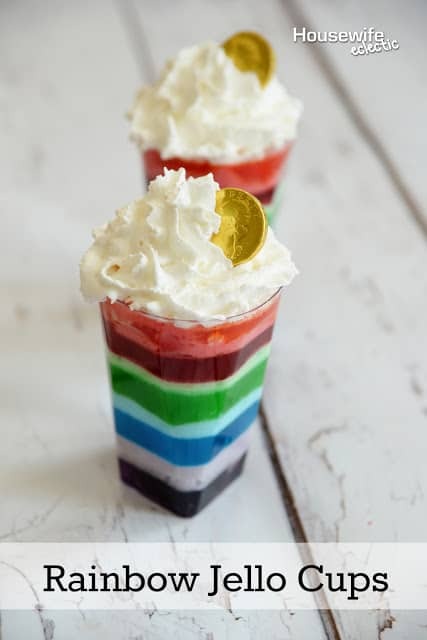 Your rainbow jello cups are the cutest things ever aren't they? I would need to hunt for some veggie gelatine to make these with do you have any ideas? This is so cute and festive at the same time! I loved that you tucked the little chocolate coin in there. Adorable! This is such a cute idea. Love the little gold coin touch!